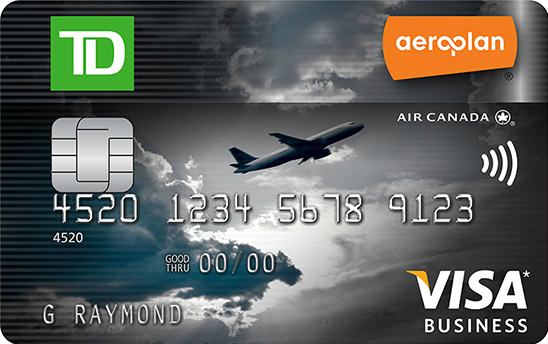 The TD Aeroplan Visa Business Card has historically offered a very competitive level of bonus miles, although this is the first time we’ve seen a first-year annual fee waiver from it. Until June 2, 2019, you can earn a total of 45,000 Aeroplan miles with this card, and the annual fee of $145 is waived for the first year. 5,000 miles for having an existing “an existing qualifying personal TD Credit Card or qualifying TD Small Business Account”. For those last 5,000 miles, it’s not entirely clear what counts as a “qualifying” personal credit card, but I imagine another TD credit card such as the TD Aeroplan Visa Infinite will count. It might therefore be a good idea to make sure you have that card before applying for this one. Click here to read the blog post covering the Spring 2019 offer on this card. Taking into account the $5,000 minimum spend, you’ll end up with at least 50,000 Aeroplan miles after you’re done applying for this card. You can also use the 50,000 Aeroplan miles towards a larger redemption, such as an Aeroplan Mini-RTW starting at 75,000 miles in economy class or 150,000 miles in business class. Supplementary cards can be added to your account and can benefit from the first-year annual fee waiver as well. After the first year, they’ll be subject to a fee of $49 per card. The TD Aeroplan Visa Infinite offers you 1.5 Aeroplan miles per dollar spent on travel and gas purchases. Meanwhile, you’ll earn 1 Aeroplan mile per dollar spent on all other purchases. Similar to the TD Aeroplan Visa Infinite, the earning rates on this card aren’t much to write home about. The 1.5x bonus category for travel and gas purchases is outstripped by the American Express Gold Rewards Card, which offers 2 Amex MR points per dollar spent on the same purchases. Since Amex MR points can be transferred to Aeroplan at a 1:1 ratio, the 1.5x multiplier on the TD Aeroplan Visa Business Card is pretty inferior and you’d be better off using the Gold Rewards Card instead. Also similarly to the personal TD Aeroplan card, you get a few perks when travelling on Air Canada on an Aeroplan reward ticket only, which do not apply when you book a revenue ticket with Air Canada. The benefits include a complimentary first checked bag, priority check-in, priority boarding, and a complimentary visit to an Air Canada Maple Leaf Lounge once per calendar year. Since these are only usable on Air Canada flights redeemed with Aeroplan, you’ll probably only find them useful when redeeming miles for travel within North America (as redeeming miles for long-haul Air Canada flights is usually terrible value thanks to the hefty fuel surcharges you incur). Notably, the TD Business Aeroplan doesn’t offer insurance for trip cancellation and interruption, which is provided as a benefit on the personal version of the card. As with the personal card, the insurance ought to apply to Aeroplan award tickets when you charge the full taxes and fees of the redemption ticket on your TD Aeroplan Visa Business Card, which is a very valuable benefit since not many credit cards out there provide insurance on award travel. TD seems to require a little more documentation for their business credit card applications than other banks, so you can’t apply for this card online, but rather must go in-branch to meet with a small business representative. They’ve provided a helpful list of the business documents that you might need to bring in order to apply. If you’re a small business owner, you should have no trouble getting set up with this card. However, if you don’t have a small business in the traditional sense and are interested in applying for the card as a sole proprietor, then you may need to try your luck at different branches to see if there’s a representative who will open the account for you. There’s been at least one data point of someone being successful doing so. You can find more information about this card at the below link, although you’ll have to visit a TD branch to apply.